Is Vilnius worth visiting? Heck Yes! There are a wide range of things to do in Vilnius for all visitors and it’s definitely a highlight of any trip to the Baltics. The city is the most populist is the capital of Lithuania. It’s a quaint town with a small population of half a million and extraordinarily welcoming. It’s the perfect place to get lost for a few days and a popular stop on the Baltic tour route. Streets are cobblestoned and the city center is the largest preserved example of baroque architecture in Europe. It’s littered with Catholic and Orthodox churches and no matter where you are in the city you can see the ever-present Gediminas’ Tower. The largest city in Lithuania and is full of small cafes, charming shops, restaurants, art, and history. We had a fantastic time exploring and can’t wait to return one day. It’s full of interesting activities and sights. 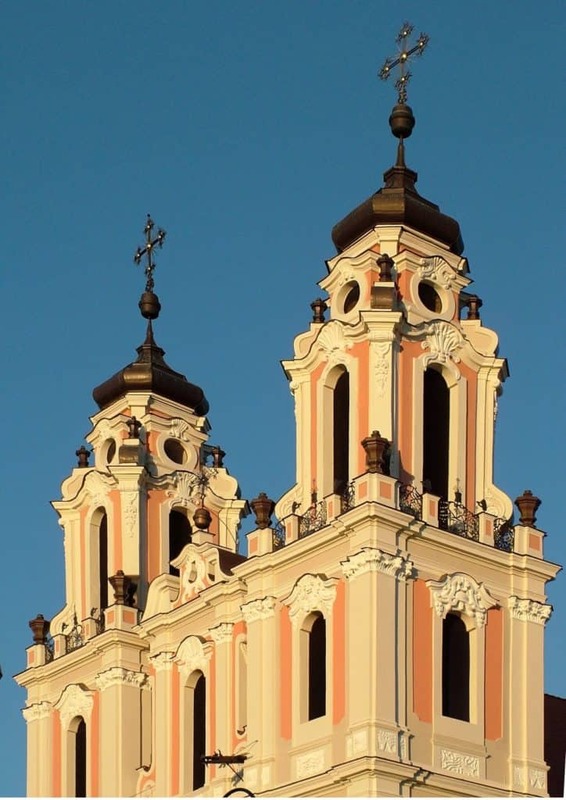 We recommend you follow our footsteps and some these great things to do in Vilnius. A European city with an old town is nothing new, but they are almost always well worth exploring. If you only have one day in Vilnius I would highly recommend staying at a hotel in the actual old town and wander around day and night from there. Vilnius’s old town is quite large, but easy to navigate. The baroque architecture is abundant and there are plenty of cafes to dip into and enjoy a coffee before moving on t.
The streets are bustling at all hours, and there is a cafe every 10 steps. The cobbled streets are extremely clean, and boast a large number of touristy sites like St. Anne’s Church and the Presidential Palace. 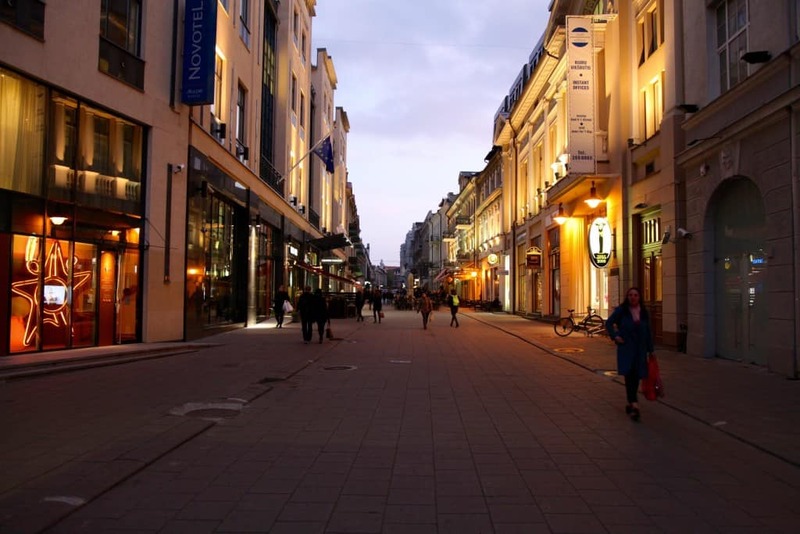 This was ones of our favorite things to do in Vilnius and any town in Europe for that matter. Another great thing to do in Vilnius, Lithuania is visit the Gate of Dawn. Also known as the Sharp Gate, the Gate of Dawn is a staple sight if you visit the country’s capital. It is particularly notable as it is the last remaining gate of five, from the wall that once surrounded the city limits. Due to the gate’s age (construction on the wall began in 1503), as well as the famed painting of the Blessed Virgin Mary in the nearby gate chapel, the site attracts pilgrims and travelers from all over the world. Nowadays, it’s something of a shrine. Since the Virgin Mary is often associated with sunrise, the gate became locally known as the Gate of Dawn. Without even realizing it, we had crossed the bridge over the Vilnia River and were in the Republic of Uzupis. A self-governing “free town,” similar to that of Freetown Christiania. Uzupis has its own president, currency, and constitution and is very charming to walk around in. There is a bohemian and artistic feel to the small area, and you can find yourself exploring the art installations while lazing about the Vilnia River. 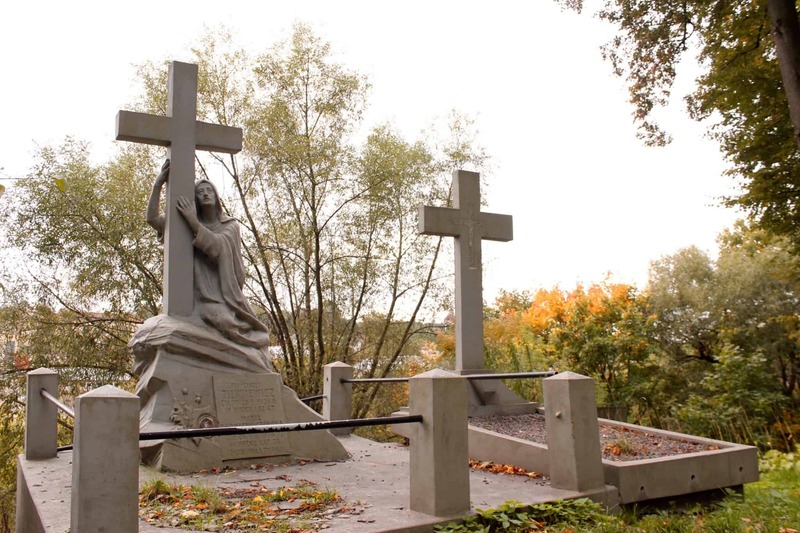 I’ve never been a cemetery expeditionist, but this particular Lithuanian cemetery is a gorgeous place to visit in Vilnius. Just to the east of the Uzupis district, you will find the peaceful graveyard overlooking the city. Venture in and pay your respects, you won’t regret it. It is one of the many free things to do in Vilnius as well. If you’re up for it, the Museum of Occupations and Freedom Fights (also known as the Genocide Museum) is definitely worth a visit to pay respects and homage to a dark period in the country’s history. The building’s history is one of invasion and bloodshed; it first served as the Gestapo headquarters during the Nazi occupation in 1941. When the Soviets re-took the country in 1944, the building was used by the KGB to detain, imprison, torture, and execute all those who resisted Soviet rule. The building is now a museum, where visitors can tour three floors; the top two outline the day to day life in the country and Lithuanian resistance against the Soviet Union, while the basement houses the prison where torture and execution would take place. This museum is a chilling reminder of occupation and power, and the consequences of fighting back. There are three locations around the city to try cheap local Lithuanian food. They have many draft beer options ranging from €1.30-€3. Come hungry and leave 10 lbs heavier from the hearty meat and potato pancakes. Now would be a good time to walk around old town. Remember that it’s common to tip 10% on food bills in many parts of Europe, read more about tipping in Europe. Look at the size of those €2 beers! 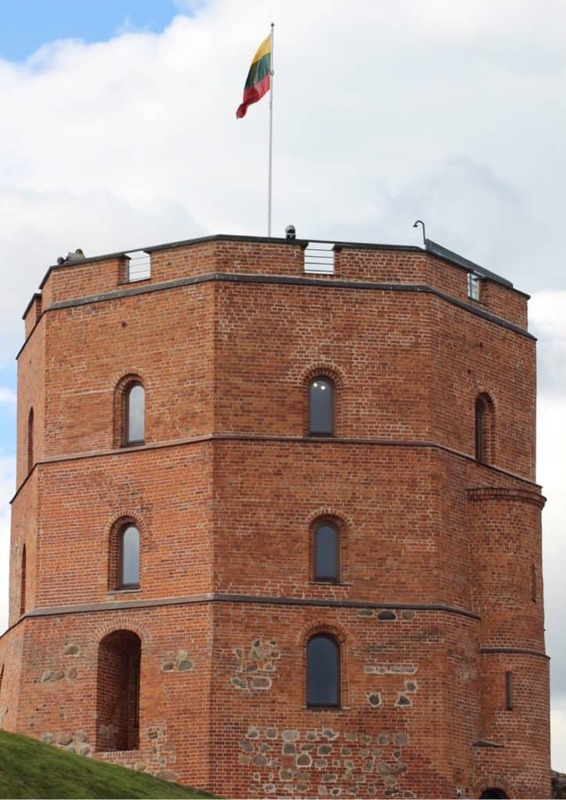 For the best views of all of Vilnius it’s best to head up to Gediminas’ Tower, the remnants of the upper castle. There is also a museum inside for €2. Once done with the tower walk down and head over to the stairs leading up to The Three Crosses. 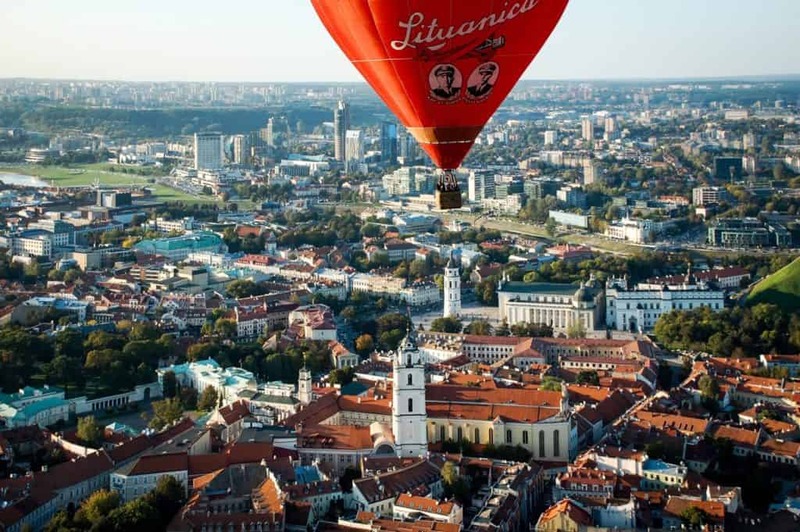 At the top, you will find amazing 360 views of Vilnius. The monument is a dedication to Lithuania’s dark past with the Soviet Union. In my opinion this is one of the greatest things to see in Vilnius. We recommend Trakai Castle as one of the top things to do in Vilnius even though it’s not in the city. It makes for a perfect day trip and only takes a 30-minute bus ride to get to Trakai. 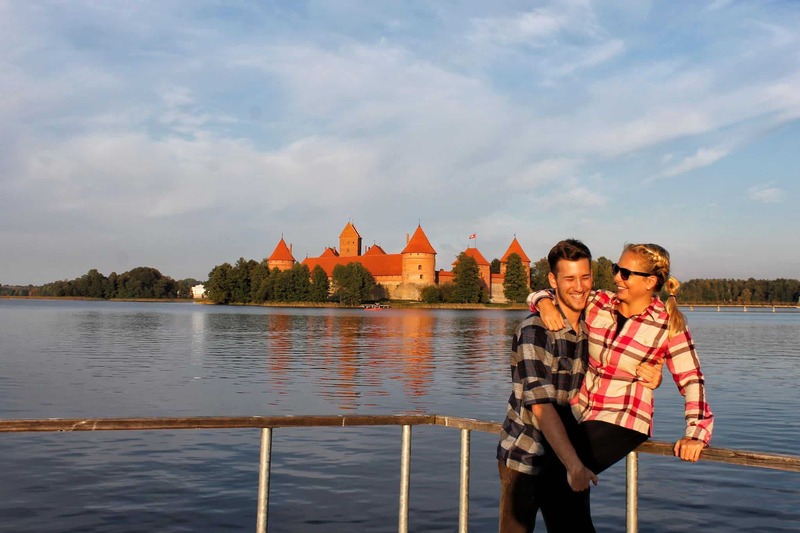 The most popular thing to do in Trakai is visit Trakai Castle, a 14th-century castle surrounded by Lake Galve. It’s truly stunning to see, and I would highly recommend paying the €6 to go inside (€3 for students). At least a half day is recommended for this day trip, buses leave regularly and are €1.77 one way. The Lithuanian Opera and Ballet Theatre has numerous performances every week. Tickets are incredibly affordable starting at just €3 a piece. Catching a show is perfect for couples especially looking for a romantic night out in Vilnius. Several publications have frequently referred to the Church of Sts. Peter and Paul as one of the most beautiful in Europe, alongside churches in cities such as Venice, Madrid, and Krakow. Once you arrive, it’s not hard to see why. The interior is a vibrant display of baroque architecture, and over 2000 stucco figures decorate the inside of the church hall. Though the church was originally a simple wooden structure, it was destroyed during a time of war with Russia. Its reconstruction resulted in the building that stands today, a rich and visually astounding tapestry of styles. The inside has a main nave, but also side altars and several chapels. Though its interior is a fascinating blend of styles and decor, there are no surviving records to explain who may have designed the stunning interiors. If you’re passing through the Old Town of the city, then chances are you won’t be very far away from the Church of St Johns. Annexed as part of the Vilnius University, the interior of the church is Gothic, per its original construction, while its exterior now reflects the late Baroque style after it was redesigned. It has always been (and continues to be) a site for major community events in the city, from protests and performances to royal welcomes. If you’re looking to take your visit to the next level (pardon the pun), then be sure to visit the campanile of the church. At only €2,50, it’s the highest point in the city, meaning that the views you’ll get from the top pretty much can’t be matched by any other structure in town. Built by an Italian architect in the Baroque style, it’s no wonder that the Church of St Theresa turned out to be such a visually attractive structure. Its exterior is intricate (mostly sandstone and granite), but not particularly embellished; the true jaw-dropping beauty was saved for the interior. Its altar is one of the highest and most beautiful in the country. The high vaulted ceilings, bright frescoes, and incredibly detailed carvings and sculptures make the inside of the church truly a wonder to see. It’s extremely close to the Gates of Dawn, so bundling the two can help you manage your time to make the most of your day. It’s not quite a wishing well, but according to legend, this magical tile tucked away in Cathedral Square has the ability to grant wishes and make your dreams come true. 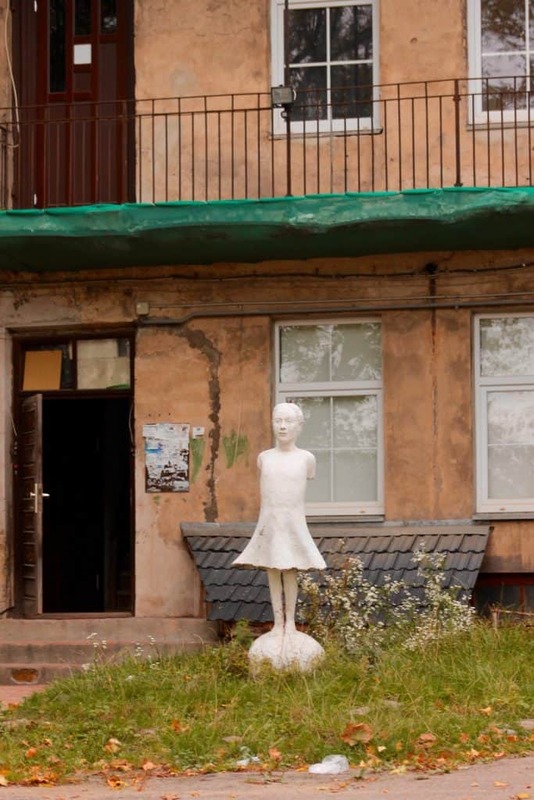 Whether or not that’s true is up for debate, but the stone has a much richer history than simply granting wishes: it was once a powerful display of quiet protest during the dying days of the country as a republic under Soviet Rule. Around two million people banded together to make a human chain by holding hands all the way from Estonia, through Latvia, and finally ending at the tile in Vilnius—a powerful statement against the rule of the USSR and highlighting the strength of human spirit and togetherness. It’s supposedly most effective as a lucky charm if you happen to stumble upon the tile without seeking it out, but you’ll never know until you try! If you’re looking for a list of staple things to do in Vilnius, you can’t miss the Cathedral and its basilica. Its exterior is austere but inviting – a grandiose display of bright white façade and large stone pillars. There are multiple statuettes of evangelists and saints adorning the exterior, and in the square just outside stands the freestanding bell tower, which shows where the river originally flowed through the city. While the bare and undecorated insides of the cathedral bear witness to the repercussions of Soviet rule, visitors can still appreciate the size of the interior hall and even take a guided trip down to the cathedral catacombs, where many dukes and kings are buried. Still wondering what to do in Vilnius? Many people don’t think of Lithuania as a premier holiday destination, so chances are if you’re here, you’ve got some interest in culture and history. If that’s the case, there’s no better way to immerse yourself in its rich history than to visit the National Museum. The displays showcase the history of Lithuania all the way up to modern times. There is a monument nearby dedicated to the country’s last king. A funicular nearby will take you up Gediminas Hill. The museum’s exhibits are specific and detailed, with displays ranging from numismatics (ancient coins) to archeology and iconography. It’s closed on public holidays, but at only three euros, it makes for a great, inexpensive daytime activity, where what you’ll see far outweighs the admission fee. We’re pretty into old things but will give bonus points if they are old walls. To see ancient structures like this – particularly ancient defensive structures – holds a level of fascination often not present in your typical church or museum. The Artillery Bastion was first built in the 17th century and became damaged during wars with Moscow. Today, much of the bastion remains; the tower, underground gun ports, and tunneling are still mostly intact. There’s a connecting museum showcasing some more military-specific history of the city as it relates to the wall. After you’ve taken your fill, step onto the Bastion Terrace for some seriously spectacular views of the city. If you passed a pink-ish church and wondered what it was, it’s St Casimir’s Church. Built by Jesuits to honor St Casimir in 1604, the original structure was burnt down several times over the course of a few decades. Thankfully, it was finally restored to the façade that stands today—hence why its decor is a patchwork of Baroque, Renaissance, and Gothic. Its interesting exterior is just a preview of the detail contained inside; rich and intricate baroque altars adorn the inner hall. During the Second World War, the museum was closed, mimicking the fate of many churches in the country. It became a museum of atheism until 1988 when it was re-consecrated and reincarnated as a Catholic church once again. You could call this a food court if you really wanted to, but you wouldn’t be doing it justice. The Uptown Bazaar is a vibrant and rich mix of scents and sights, with a near-endless array of dining options – from international cuisine like ramen, tapas, or Thai, to national dishes and even burger joints and taco stands. Bring your appetite; you definitely won’t leave here hungry as it’s one of the best places to eat in Vilnius. This spot is for everything – from a casual brunch or a huge dinner party to laidback drinks at dusk. Boasting a total of 27 restaurants and bars, there is even a fresh grocer where you can purchase produce and other goods—just in case you’re more of a DIY kind of person. Not your typical thing to do in a European city, but a street art tour is still pretty cool and a wonderful way to cast new light on ancient surroundings. Vilnius, like many other cities all over the world, has its fair share of street and graffiti art. 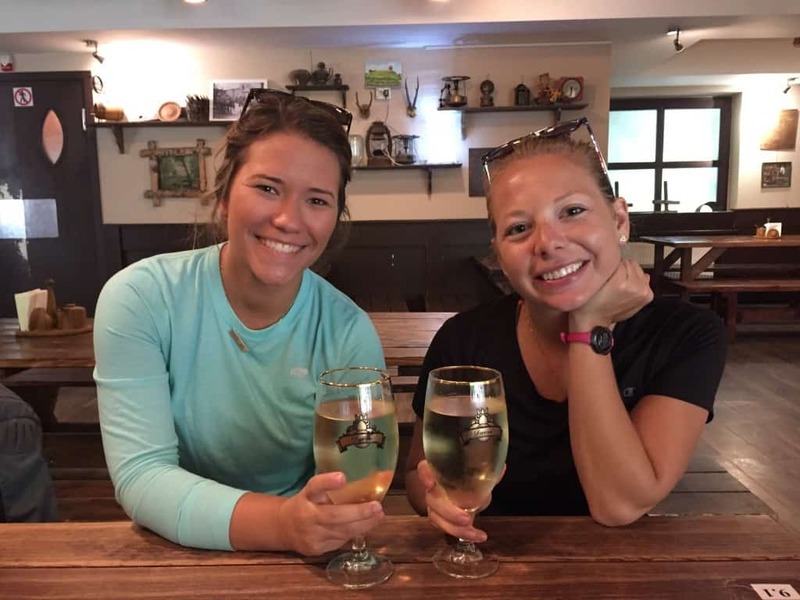 Taking a little tour of the notable points around town can be a great way to see the city while also getting a little exercise and venturing off the beaten tourist path. Arguably the best-known piece is the wall featuring Trump and Putin – the latter having cigarette smoke being blown into his mouth (the original wall featured a passionate kiss, but after some controversy, the mural was adjusted). The wide range of artistic styles, colors, mediums, and mural sizes indicate that there is some serious talent rampant in Vilnius, so even though this is a more time-consuming outing, it’s totally worth it to see the art. This particular church is a little more ornate than many others in the city. It’s generally seen as a Gothic masterpiece that has retained all of its original glory and grandeur, having fortunately come to no harm or destruction in her 500 years of standing. That said, its original structure was a wooden church built for Anna, the Grand Duchess of Lithuania. A beautiful bell tower – also constructed in the Gothic style – stands nearby. Not surprisingly, Napoleon himself fell in love with it—so much so, in fact, that he wanted to take it back to Paris in the palm of his hand. Unfortunately, this was not possible, so he may have needed to come back for a visit or two. The church is an easy walk from the nearby cathedral, so this can be tacked on to your cathedral visit. 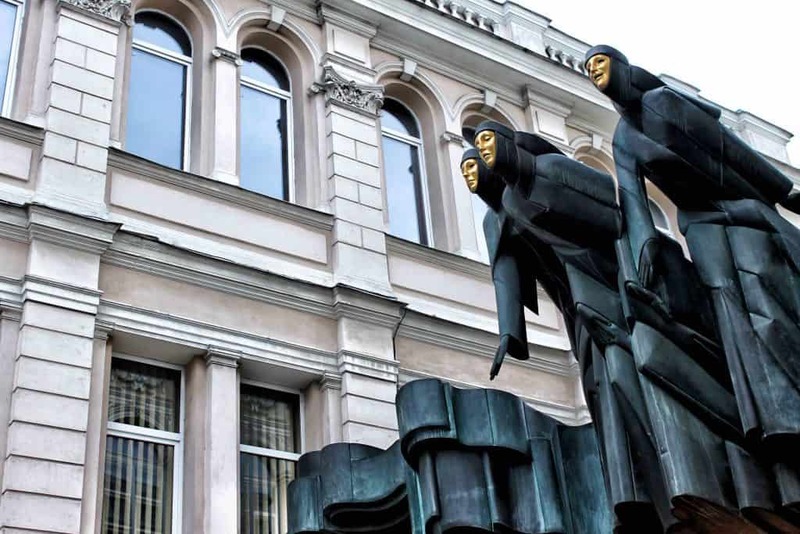 This is limited to those traveling to Vilnius in the summer months, but its status as a cultural city icon earns it a mention on this list. One of the country’s longest running music festivals, it takes place over a period of two months, with countless musical acts across dozens of venues throughout the city. The general theme behind the festival is diversity; this comes across in the musical acts, the artists of which travel from all over the world to perform. Everything from sacred choir music and smooth jazz to a group known only as the Crazy Saxophones play for this festival. It’s a little quirky and definitely on the experimental side of creative, but well worth taking in a show or two if you’re in Vilnius over the summer! Most museums tend to be historical, and while Vilnius does have its fair share of museums depicting the city and country’s rich history, this particular museum is a little more on the fun side of things. It’s fairly new—only open since 2016—and features over 70 exhibits featuring mind-bending optical illusions, virtual reality, and installations designed to have you questioning your eyes! There are also dance performances, most of which are combined with an LED light show for something truly visually spectacular. While this isn’t going to enrich your view of Lithuania or help you understand its history, it’s a good way to unwind after a day of exploring churches and human history museums. Plastic pollution is a problem around the world so it’s best not to contribute to the problem buying plastic water bottles everywhere – plus the water from the taps here is perfectly safe to drink in Vilnius. We’ve shifted to using an insulated aluminum water bottle as it handles the hot sun well. However, we also love filtered water bottles in areas we’re uncertain of the water supply. Read more about favorite water bottle for travel in our post. This is an essential travel item that everyone should throw in their bag when on their way to Europe. 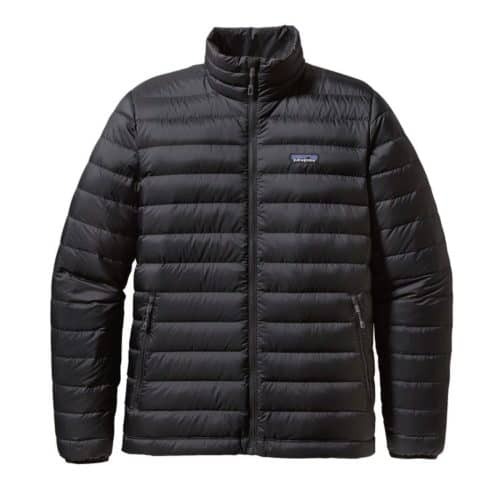 One of the best packable down jackets is one of the most versatile travel items on the market. When layered it can handle cold winter weather, but it’s also light enough to be worn on a cool evening walking around Vilnius. It’s a lifesaver for northern Europe and it’s great for summer in Europe too as Lithuania can still get very cool in the summer so having a warm jacket is always appreciated. See the Full European Packing List Here! We stay at Airbnb’s around Europe and always have a great experience. To feel more at home we use Airbnb you can check out some tips and read more about getting an Airbnb coupon code here. Or just take this coupon for your first stay! A beautiful 19th-century building in Vilnius, Hotel Vilnia is just a 3-minute walk from Gediminas’ Tower and has an on site restaurant serving local cuising. Right in the heart of the Old Town district of Vilnius, The Joseph Signature Hotel Vilnius is only 300 m from Lithuanian National Opera and Ballet Theatre and an 8-minute walk from Gediminas’ Tower. It’s centrally located and absolutely beautiful inside. Have you been to Lithuania? What things did you do in Vilnius? A Winter Packing List for Europe!